2) Battery powered and solar assisted. 3) Cool skull shaped welder's helmet. 4) Two independent arc sensors. 5) Fit for various welding applications, gouging and cutting. 6) Large lens for high visibility. So, in a nutshell, it works pretty well, and I love the looks. The screen is very clear, so I can actually see exactly what the hell I'm welding. It's lightweight and confortable. It has room for my glasses under it. If you want to have the coolest helmet in the shop, this is the one. You may actually use it for halloween! However, it does not cover your head very well. Beware of slags flying on the top of your head. I wear a cap when I weld. 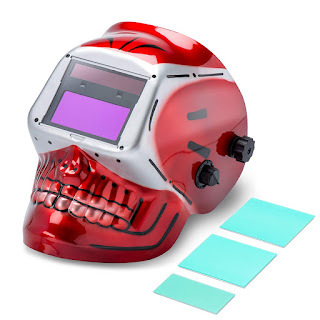 I don't think this helmet will hold up to industrial applications.